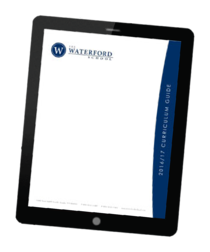 Download a copy of Waterford's Curriculum Guide. This roadmap to student learning will provide you with a clear understanding of what you can expect your child to learn throughout the Pre-K to 12 Waterford experience. The Curriculum Guide outlines The Waterford School's vertical curriculum, its value, and how it will shape your child's education. The Waterford School is a top private school providing a liberal arts, college preparatory education, with experienced faculty, rich curriculum, nurturing community and a beautiful 40 acre campus. Waterford enrolls preschool and kindergarten, elementary, middle school and high school students from Salt Lake City, Holladay, Sandy, Draper, Park City, Utah County and throughout the Wasatch front.